It’s that time of the year again! Our neighborhoods are lit with elaborate light strands, large holiday yard fixtures, and the fireplace seems to be on more than it’s off. This time of the year also means SNOW, and lots of it. While it’s a beautiful time of year, it’s also can be a dangerous one for your health. Each year we see countless cases of people straining themselves shoveling snow aside so they can walk in and out of their homes and out of the driveway. Shoveling snow is an exercise, a lift, and a movement that requires the body to utilize and activate certain muscles, so treat it that way! If you were getting ready to go on a run, or were preparing for your chest day at the gym, you would warm up and stretch those muscles properly before because that’s what you’ve been taught to do. Snow shoveling should be treated exactly the same way. One of the most common illnesses this time of the year is colds, runny noses, sore throats, and other ailments from exposure to different temperatures. You are going from warm to cold, and vice versa, so make sure you error on the over-dressed side when preparing to snow shovel. Not only does this prevent illness, but it is also important to keep your muscles warm and loose when exercising. 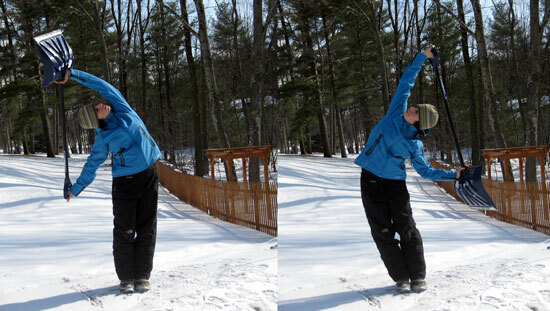 You want to make sure you are efficient when snow shoveling. Make sure your shovel is long enough for you, so you aren’t bent over too far to compensate. Bend at the hips and knees, not at the back. This will take stress off your lower back, preventing injury. If you’re going to lift the snow, grip with one hand as close to the blade as you can while remaining comfortable. This will evenly distribute the weight and lessen your effort. Additionally, try to avoid reaching, twisting, and throwing. It is much better to walk the lifted snow to the desired place than launching it like an Olympic Field Athlete. Protect your body. If it is possible to use a snow blower, do so. This is a very good investment for your time and your health. When you use one correctly, you can avoid stress on the lower back and also speed up the process. It is still important to remember to bend at the knees and hips with one of these machines though, and try to focus on driving with your legs rather than your upper body. If you begin to experience back pain or any other injury while snow shoveling, remember not to ignore it. The more strain and use you place on your injury, the more damage can be done. Seek professional help to avoid further injury. People experiencing snow shoveling injuries in the Reading area can visit our office to receive proper assessment and specialized injury treatment. Chiropractic care can help you heal faster after an injury and help prevent injury for the next snowfall! 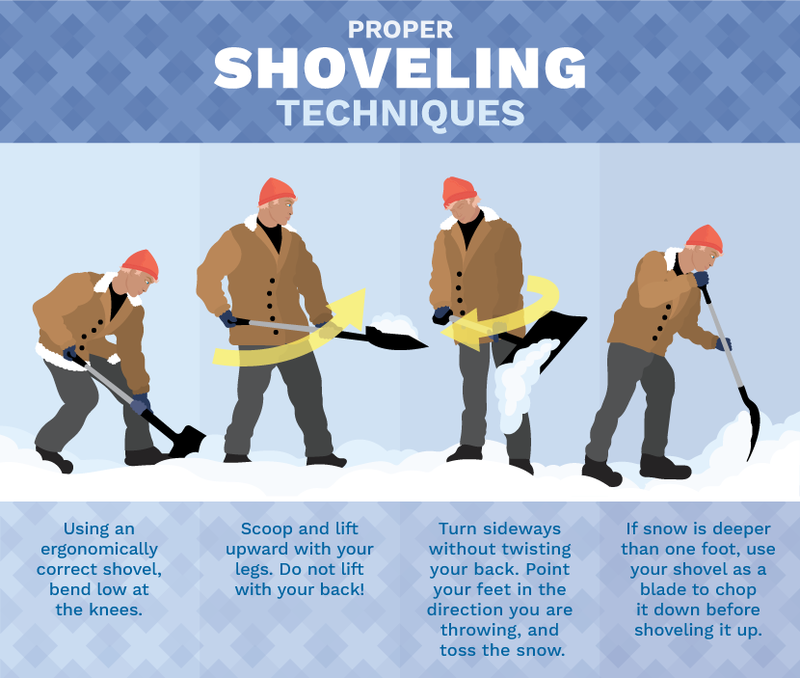 Pain and injuries from shoveling snow happens every year, so it is one of our top priorities to educate and prevent such injuries. If you follow these five simple steps you can avoid injury and educate others as well! Contact The Spine and Wellness Center at 610-779-4588 if you are experiencing any pain this Winter, and we can get you back to feeling yourself in no time.